Do you still remember those years at EPUL or EPFL? Places and words like Agepul/Agepoly, Sat, Balelec, CO1, Esplanade, Rolex Learning Center, Parmentier, Flash Magazine bring back memories and travel across generations. 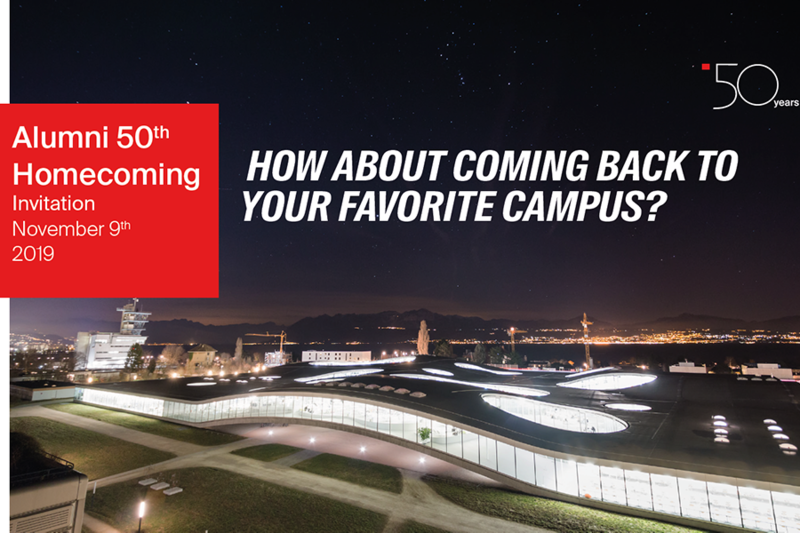 As EPFL celebrates its 50th anniversary of becoming a federal school, it is an opportunity to reunite its alumni to celebrate all the milestones accomplished to become an institution recognized worldwide and look at the future of our school. followed by a diner party with champagne, music and dance. Afternoon campus tour and activities will be free but the other parts of the program require registration and a contribution with limited number of places. So make sure to take your tickets early to guarantee your spot. Contributing members 2019 will benefit from preferential rates. Connect to the platform to find out about your membership status (if there is a star next to your name in the search tool, you are a contributor) or click here to become a member. Note that you are welcome to come with your partner. Contact your friends using the EPFL Directory and if you need help contact our alumni office at alumni@epfl.ch if you need assistance. If you need a hotel, take advantage of the preferential rate and pre-booked rooms at the Starling and SwissTech hotels, valid until end of September. Click here to register, find out about the rates and participants. In the coming weeks, we will provide more details on the program and speakers. Looking forward to welcoming you on your favorite campus!